Draggins Rod & Custom Car Club - On the 8th Day...God Created Hot Rodders. On the 8th Day...God Created Hot Rodders. Early in 1957 informal meetings started taking place regarding the forming of a car club in Saskatoon. Discussions revolved around what kind of a car club it should be and to choose a name. In the fall of 1957, after returning from their first car show in Edmonton, Alberta seven car enthusiasts formed a club to further their hobby. On October 3rd, 1957, the first recorded meeting of the Draggins Car Club was held at Ian MacDonald's mother's home on Clarence Avenue. The mandate of the club from that very first meeting was to promote their hobby as a safe and credible sport to the general public. The club also decided that it would be a supporter of all types of motorsport. In the winter of 1958-59 they held ice drags on the Hudson Bay slough just north of Saskatoon, a silver collection was taken to help with club projects. In 1958 a super modified stock car was sponsored by the club, driven by member George Kuenzig. The money was raised in part by the members installing a guard rail around the stock car track. Other events that helped raise the public's awareness of the Draggins Car Club were the displaying and building of floats for the Travellers Day parade in the late 50's and early 60's. Donating blood to the Red Cross, delivering hampers, ringing bells for the Salvation Army Red Shield Appeal as well as selling Christmas trees in Dec. 1958 and providing safe rides home for the public on New Year's Eve. fireplace was constructed and the building wired, insulated, gyproced and painted. Furniture was then brought out from some of the members basements to furnish the club room. In the spring of 1960 the electrical was hooked up. 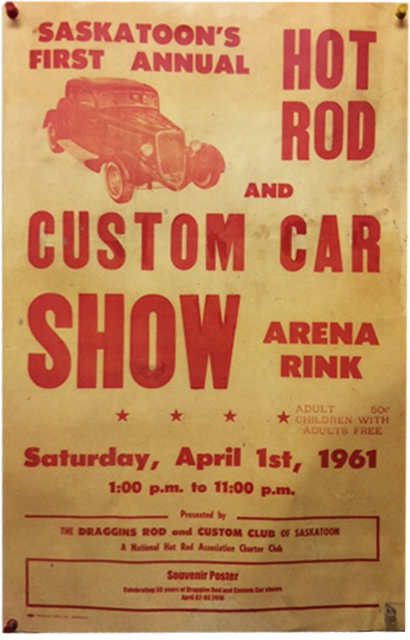 In 1961, on Friday, April 1st (Easter weekend), the First Annual Draggins Car Show was held in the Saskatoon Arena, presented by the club to help increase exposure and to provide an opportunity for motor sport enthusiasts to display their creations to the public . The success of this one-day car show served to motivate the club to expand their show to two days and move to a larger facility, and the big step was taken in 1964 with the move to the Jubilee Building on the Exhibition Grounds. 1976 would bring on the Draggins first project car, raising $23,000 for the Saskatchewan Council for Crippled Children and Adults. This tradition continues today, with each ticket raffle growing more successful and providing more upgrades to Camp Easter Seal. One of the more memorable project cars was in 2007, when Global Television made an hour long production following the building of a 1965 Pontiac Parisienne, Project VIII, from start to finish. With the construction of a new multi-purpose first-class premium facility being built in Saskatoon, the Draggins Car Club entered into a new era, and were able to expand into a full spectrum car show. They provided participants, exhibitors and spectators with more displays, plus an increased area for viewing. On Friday, April 1st, 1988, the 28th annual car show was premiered at Saskatchewan Place. The show was successfully held for there for 19 years while growing larger and more diversified. After much consideration the decision was made to return to the Exhibition grounds and the new Prairieland Park for the 47th show in April 2007. The Draggins Car Show is now considered one of the largest and longest running Club-operated car shows in Western Canada. Realizing the success of these car shows and feeling the need to say thanks for the great support of the community, the participants, and their sponsors, the Draggins Car Club made the decision to support many worthwhile charities, the main one being "Camp Easter Seal" of the Saskatchewan Abilities Council. Through the years, events and members have come and gone, lots of wonderful friendships have been made, but the Draggins have never forgotten their roots. They still ring bells for the Salvation Army, and show up at many other community events with their cars, promoting their sport and helping to give "Street Rodders" a good name in the community. The dedication from the members, past and present, has made The Draggins Rod & Custom Car Club and the Draggins Car Show household names in Saskatoon, Saskatchewan, and all of Western Canada. In January of 1997 the Draggins Rod and Custom Car Club was one of the first inductees into the Saskatchewan Motorsport Hall of Fame for the contribution they made to the wonderful world of motorsport. We are humbled and honoured by this. The club celebrated their 50th Anniversary in 2007, a mile-stone for independent car clubs in Canada. The mandate started all those many years ago has been long held up and will continue for many years ahead. The 50th Annual Draggins Rod & Custom Car Club Show in April 2010 is a testament to each and every member, past and present, that has helped the club achieve what they are today. The current membership, their spouses and families wish to acknowledge and thank all of you for your generous support over the years. This support from the general public, car enthusiasts everywhere, along with all the former members and present day members, has given this club many great years to remember.